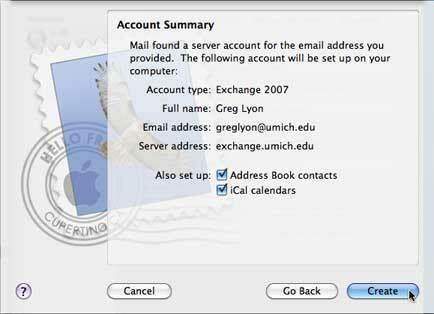 This document provides information for accessing your ITS Exchange account using Apple's Mail and iCal programs. Note Mac OS X 10.6 is required. 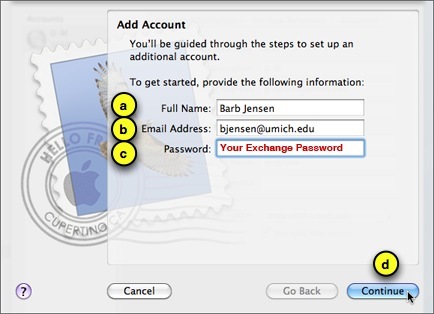 With the release of Mac OS X 10.6 (Snow Leopard), Apple began providing support for Exchange. This configuration refers specifically to the Exchange Service provided by Information and Technology Services (ITS). Some schools and departments — including the Business School, Business and Finance and Institute for Social Research (ISR) — provide their own Exchange services. Start Mail. If you have not previously used Mail, proceed to step 4, skipping steps 2 and 3. Under the Mail menu, select Preferences. in the Full Name field, enter your name as you want it to appear in the From field. 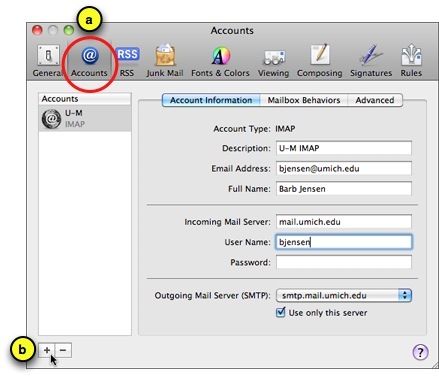 in the Email Address field, enter your e-mail address in the form uniqname@umich.edu. in the Password field, enter your Exchange password. After a short period of time, you will receive an Account Summary window showing your Exchange account information. Determine if you want your Apple Address Book populated from your Exchange Address Book list; click Create. After another short period of time, you will be redirected to the Preferences Accounts window with your Exchange account added. Warning We highly recommend that you delete your password from the Password field. You will be asked for your password when you want to access your account rather than automatically logging in. 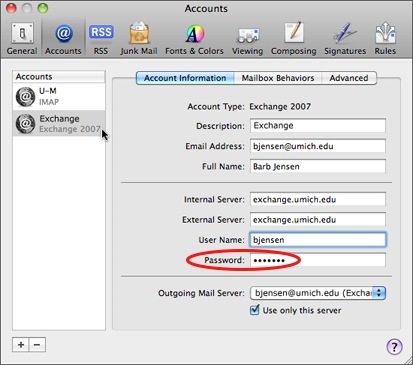 This will protect you from others accessing your Exchange account where they could read your e-mail, send e-mail in your name, and maliciously access your calendar.